Some people take their Nerf dart blasters very seriously. There are entire leagues dedicated to running around and blasting fellow players with foam darts—essentially a less painful version of paintball. But what darts are worth arming yourself with? Nerf expert Frank Cooper breaks it down in this exhaustively comprehensive comparison video. Hasbro’s Nerf brand certainly makes a high-quality dart for its toy blasters, but they’re also more expensive than third-party alternatives. 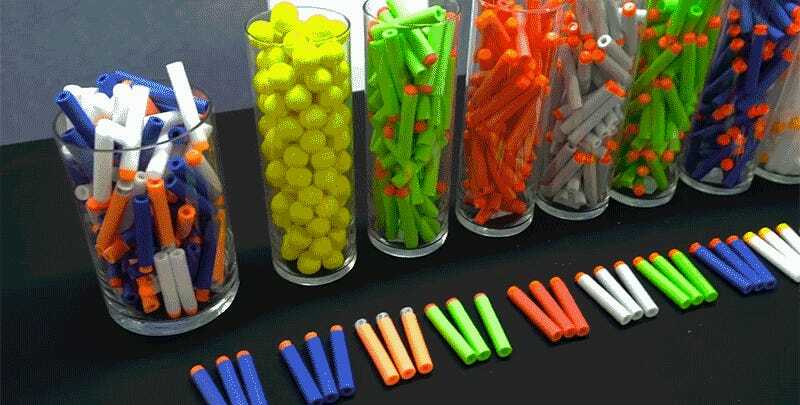 And when you’re planning to spend a few hours launching hundreds of darts at your friends, you don’t want to hesitate on the perfect shot because you’re worried about losing a pricey piece of foam. As Frank reveals, after about half an hour of exhaustive testing, you might actually be better off going with a cheaper option to simply overwhelm your opponents.